There have been some reports that compaction was causing larger memory spikes than was desirable. 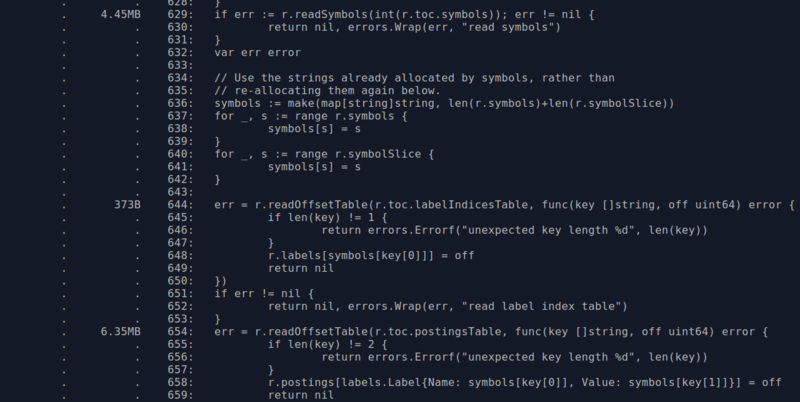 I dug into this and improved it for Prometheus 2.6.0, so let's see how. There's no external indication that compactions have completed, so we'll cheat by sleeping. We're also working with a relatively small amount of data, so setting runtime.MemProfileRate = 256 at the start of the program will track far more allocations than the default of one in every half million and make results more deterministic. 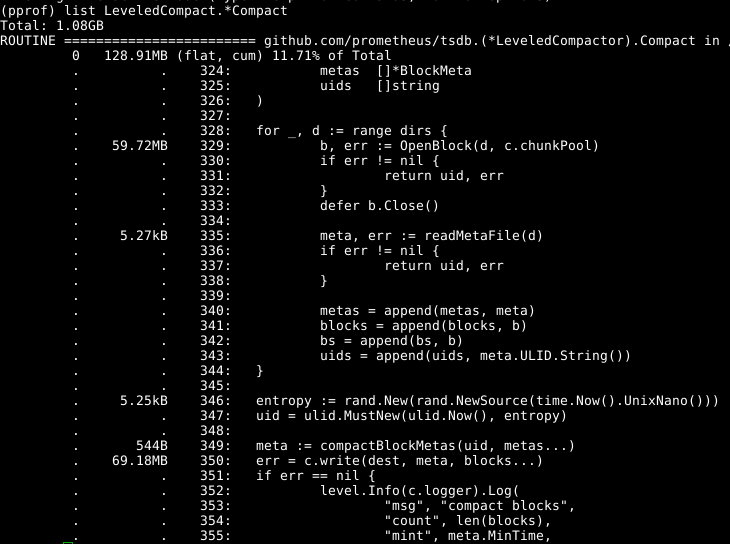 So in this run we see that compaction is allocating around 128MB of RAM, and 60MB of that is line 329 opening blocks. 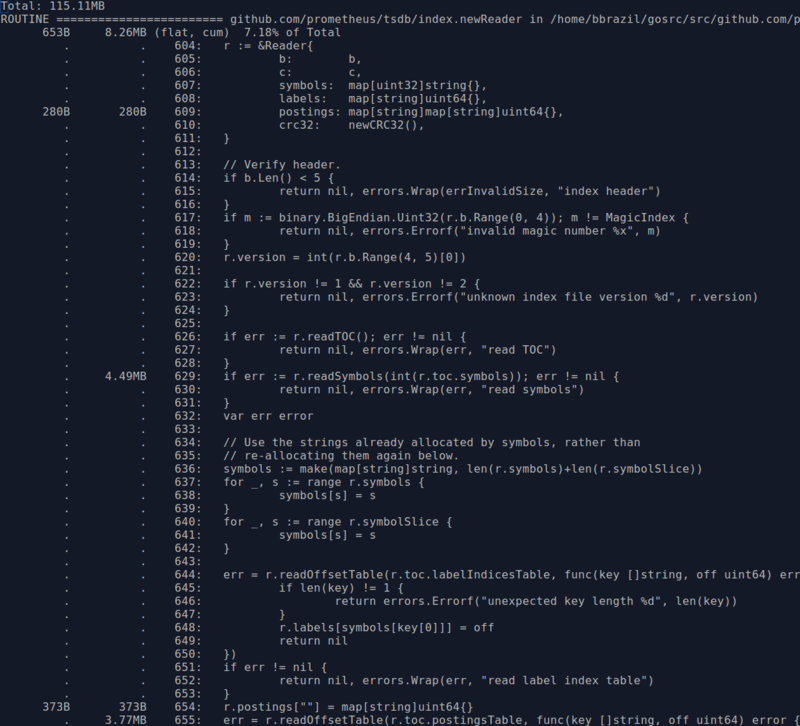 Digging into it, this is all largely the index related data structures. But compaction is almost always done on blocks we already have open in memory, why not reuse those rather than reading them in again? PR 441 did exactly that, roughly halving the memory usage of compaction. Due to how the code is structured, there's no risk of the blocks being closed under us. Where do we go from here? Line 350 is the rest of the usage. Digging through the code and looking at the web graphical output of pprof it is populateBlock where the usage is, as it builds up combined in-memory index data before writing it all out. This is the same code as what the head block uses for its index, so any improvements from here will also benefit general memory consumption. We can also look at reducing the memory usage of the index data structures for blocks on disk. Another thing is that the postings key is the label name and value in a struct, which is to say that for each distinct label value there's the overhead of also storing its label name. By using a two level map we can avoid this. There's not really a risk of this inadvertently increasing memory usage as the number of label names should generally be below a hundred, and a large number of labels with cardinality one would be quite unusual. So we've now roughly halved the memory usage for block indexes for this particular test data set. The last technique can also be applied to the head in-memory index data, dropping the usage of MemPostings from 12MB to around 10MB for this data. Memory optimisation tends to be a bit trickier than CPU optimisation, as often you need to reconsider your data structures while still keeping all the uses of them reasonably performant. Want to improve performance of your monitoring? Contact us.